The Twin Bridges area is the fourth world in Super Mario World and by far the shortest, with only two levels required to be beaten before you can take on the castle guarded by Ludwig von Koopa, and only five levels in total. The world sports a unique layout. By default, only the bottom bridge is visible, and this is where you will end up if you come here from Lemmy's Castle in Vanilla Dome. 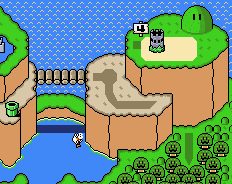 However, if you come from Vanilla Fortress instead, the upper bridge will materialize, leading to different levels. Despite its shortness, this world does have an uplink to Star Road accessible from the bottom bridge. This page was last edited on 4 August 2013, at 13:56.